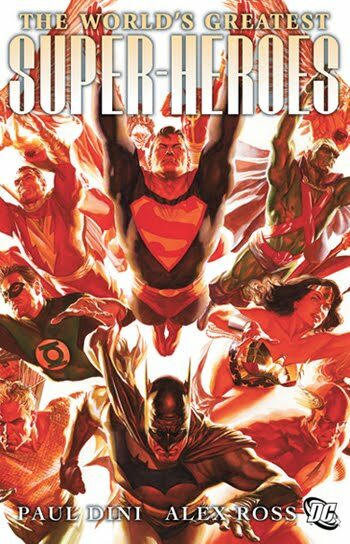 It's the cover to The World's Greatest Super-Heroes trade paperback, by the consistently amazing Alex Ross. No matter how often he paints the DCU I don't think my jaw's ever not going to hit the floor. For the full rundown, including Superman: Earth One, visit DC Comics. I assume this book is reprinting those awesome oversized Dini/Ross books? I hope they do this trade at treasury size as well, but I won't hold my breath. Thanks for the comments Rob! Yip the six oversized Dini/Ross books in one place, with developmental art etc. The size is stated as 8.125”x11” which seems just a little narrower than the originals - or is that my bad math? Yeah, its a bit shy of the original, classic treasury 10x13" format.